BSR Joint Venture has won bids for the mass-transit Pink and Yellow lines under the public-private partnership (PPP) scheme, the Mass Rapid Transit Authority of Thailand (MRTA) says. BSR comprises BTS Group Holding Plc and Sino-Thai Engineering and Construction Plc (STEC) and Ratchaburi Electricity Generating Holding Plc (RATCH). It fought off competition from Bangkok Expressway and Metro Public Co (BEM) to secure the two projects. 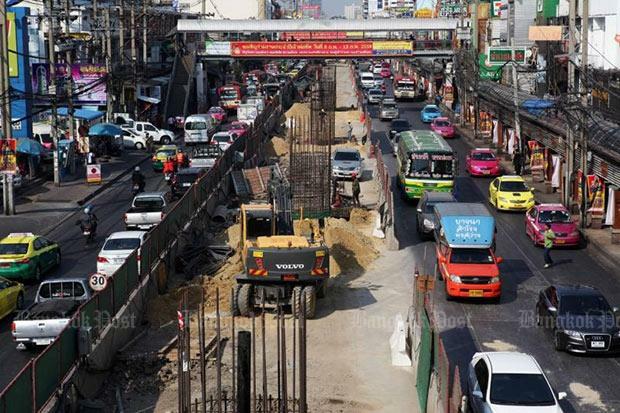 The 34.5km Pink Line worth 53.5 billion baht will stretch from Nonthaburi’s Khae Rai to Bangkok’s Min Buri district, while the 30.4km Yellow Line valued at 51.9 billion baht will link Bangkok’s Lat Phrao and Samut Prakan’s Samrong. Both are monorail projects. BSR tendered the lowest price for both projects, MRTA deputy governor Theeraphan Tachasirinugune said, adding the joint venture will now have to negotiate on these prices and other conditions with a panel formed under the PPP Act. According to an MRTA source, the BSR proposed in their bids to construct a 2.6km rail link between the Yellow and Green lines. The proposed link will run from the Yellow Line’s final stop at the Ratchada-Lat Phrao intersection to the Green Line at Ratchayothin junction. BSR also proposed constructing a 2.8km line extension from the Pink Line on Chaeng Watthana Road to Muang Thong Thani. Both mass transit lines will be implemented under the PPP model in which the MRTA will cover land expropriation costs and BSR will be responsible for civil engineering, mechanical and power systems, train operation, maintenance and fare collection. The contracts for both mass transport schemes will cover a period of 33 years and three months. The first three years and three months will cover construction with work concentrating on design, infrastructure construction as well as the installation of mechanical and electricity systems. The remainder of the contract is earmarked for operating and maintaining the two lines.